This book addresses the strategic alignment between port authorities and their supply chain partners, with a focus on governance challenges. Many port (authority) managers are engaged in efforts to improve their strategic alignment with business partners in their proximate geographic region, yet the economic objectives pursued can vary widely. These objectives can include improvements in port competitiveness and stability of traffic flows, as well as better access to scarce resources such as land and capital, or simply more control over the logistics chain. 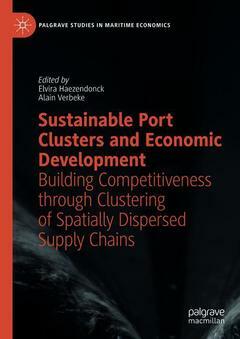 Using various Benelux seaports as case studies, the authors of this volume show that improving strategic alignment can involve a wide variety of different governance choices, ranging from top-down to bottom-up alliance formation, from project-driven to multi-activity collaboration, and from long-term contracting to full-fledged mergers. This book with state-of-the-art insight on modern port governance will be of interest to port managers around the globe, as well as to lecturers and students in maritime educational programs. Chapter 4 is available open access under a Creative Commons Attribution 4.0 International License via link.springer.com. Dr Elvira Haezendonck is Full Professor at the Vrije Universiteit Brussel, Visiting Professor at the University of Antwerp, and a guest lecturer at Erasmus University of Rotterdam and at C-MAT (University of Antwerp). Her research covers advanced subject matters in the fields of (port) management, strategy and policy. She has expertise in complex project evaluation, corporate social responsibility and environmental strategy, competitive analysis and stakeholder management. She has published various articles, books and book chapters in these domains. Dr Alain Verbeke is Professor of International Business Strategy and holds the McCaig Research Chair in Management at the Haskayne School of Business, University of Calgary. He is also the Area Chair of the Strategy and Global Management Group at the Haskayne School of Business. In 2014, Dr. Verbeke was elected as the Inaugural Alan M. Rugman Memorial Fellow at the Henley Business School, University of Reading (UK). He is the Editor-in-Chief of the Journal of International Business Studies (2017 – 2019) and has authored or edited more than 30 books and more than 200 refereed publications.